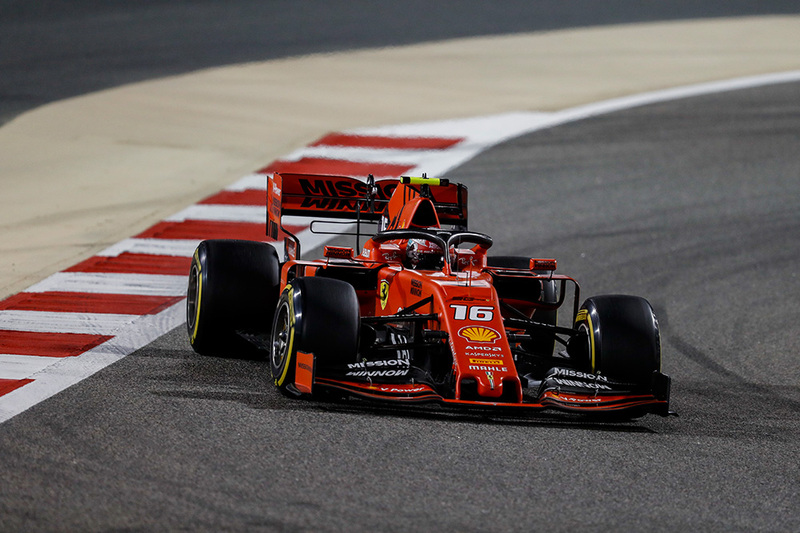 Ferrari’s Charles Leclerc was a deserved winner of the fan-voted Driver of the Day award following an excellent but heartbreaking performance in the Bahraini desert, which saw him finishing third, behind Mercedes’ Lewis Hamilton and Valtteri Bottas who were first and second respectively. Leclerc started on pole, but lost the lead off the start to teammate Sebastian Vettel. By lap 6, he had overtaken the four-time world champion for the lead, a position the Monegasque racer would hold until the closing stages of the race. One lap later, he asked the team if there was a problem with his engine. “We have no energy recovery,” came the reply. Losing an estimated 40km/h, Leclerc fell into the clutches of first Lewis Hamilton and then Valtteri Bottas, holding on to third place thanks only to a late Safety Car that prevented Max Verstappen from being able to overtake. 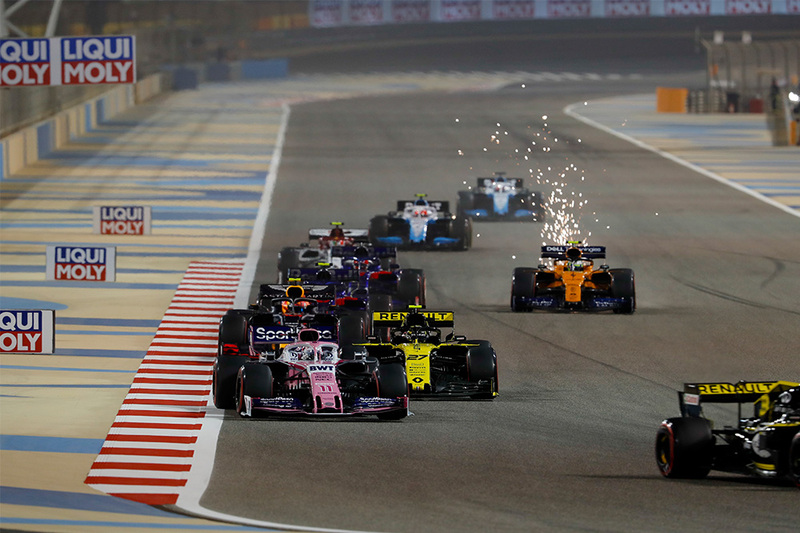 The 2019 Bahrain Grand Prix will be remembered for its engine troubles. Not only was Charles Leclerc denied his maiden F1 victory by problems with the Ferrari’s MGU-H, but both Daniel Ricciardo and Nico Hulkenberg were forced to retire in the final laps when their Renault power units began to fail. Hulkenberg suffered a visible loss of power, stopping his car trackside in a puff of smoke. Seemingly simultaneously, sixth-placed Ricciardo also drew to a halt, making it two retirements from the opening two races for the popular Australian. Even before the engine issues, Ricciardo was struggling for grip on his decaying tyres, a bold attempt at a one-stop strategy failing to pay off. The twin retirements led to a late Safety Car that decided the podium with several laps remaining. 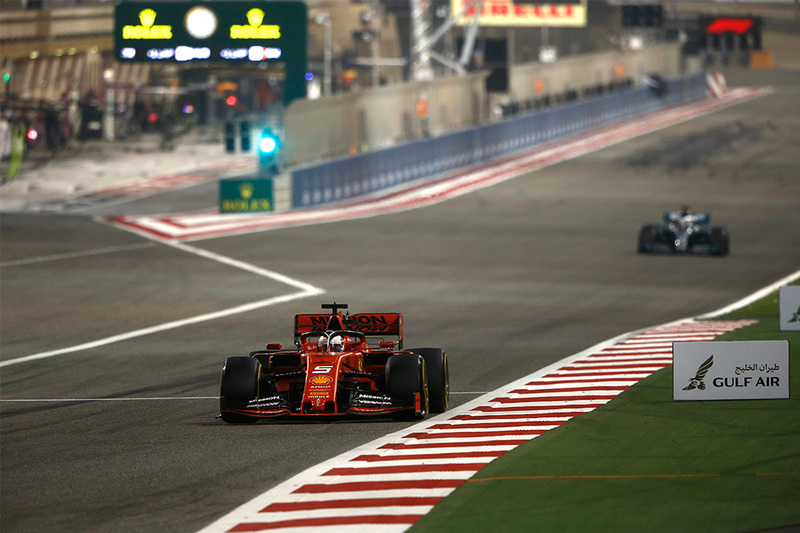 A DRS-enabled pass on lap 23 saw Vettel take second place, setting the stage for a spirited battle between the two, once Hamilton made a second stop on lap 34. Vettel pitted one lap later, and the pair were split by 0.8s when the Ferrari driver returned to the track. Two laps of wheel-to-wheel battling saw Hamilton seize the advantage on lap 38. Vettel then span unassisted, damaging his tyres and causing vibrations that would see his front wing shear off on the back straight. After limping back to the pits the rest of the evening was an exercise in damage limitation for Vettel, who crossed the line in fifth.